The Buick Grand National and Buick GNX (Grand National Experimental) are icons of 80s automotive history. Buick began building the Grand National in 1981; however, it wasn’t until 1984 when General Motors put the legendary turbocharged 3.8-liter V6 under the hood. And it wasn’t until 1987, the Grand National’s last year of production, when GM sent 547 Grand Nationals to McLaren to create the GNX. 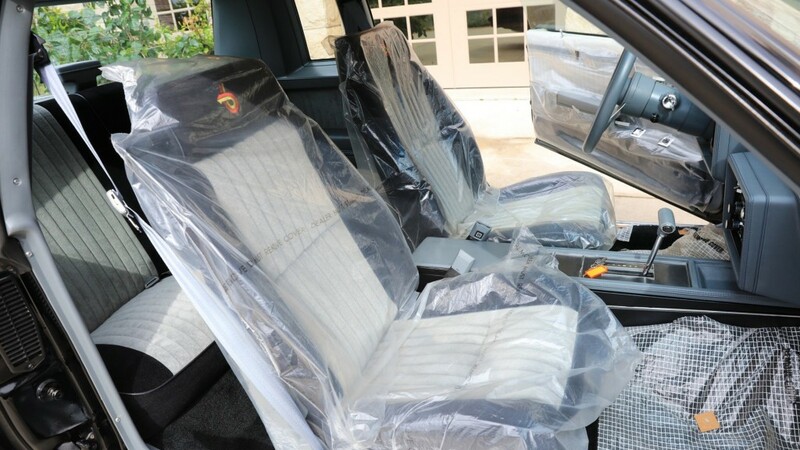 Now, a pristine example is up for auction on BringATrailer.com—it has just eight-and-a-half miles on the odometer. The Buick GNX for sale is No. 480 of the 547 produced. According to the ad listing, Ralph’s Buick in Mena, Arkansas originally sold the vehicle, which ended up in a Texas dealership showroom. The seller acquired the car in 2002, storing it in a climate-controlled showroom. Whoever buys the Buick GNX is getting much more than the pristine Buick. The GNX still features the factory protective plastic coverings inside. Other items included in the sale are the original window sticker, warranty booklet, factory owner’s manual, and a clean Wisconsin title. Under the hood is a 3.8-liter V6 with a Garrett T3 turbocharger cranking out 276 horsepower and 360 pound-feet of torque, making it 0.3 seconds quicker in a quarter-mile race than a Ferrari F40, rocketing down the drag strip in 12.7 seconds at 113 miles per hour. The engine pairs with the Hydramatic 200-4R four-speed automatic transmission, which powers the rear wheels—16-inch alloys wrapped in Goodyear Eagle VR50 tires. The owner says they are original. Right now, the current bid sits at $106,000 with the auction closing in three days. This eight-mile example is cheap compared to other Buick Grand Nationals and Buick GNX examples sold in the last few years. One GNX with 1,500 miles on the odometer sold for $117,700 at auction. Another example sold for $163,000. However, it seems low-mile Buick GNXs aren’t uncommon. In 2014, one with only 45 miles sold at Mecum. Another with 6,330 miles was up for sale in 2015. If you’re waiting for the first Buick GNX ever sold to a private customer or the last GNX, we’re sad to report those both recently rolled across the auction block in 2016 and 2017, respectively. Such a cool car. As a child I always lusted after one of these. The GM mid-sized rwd line up in the mid-eighties were nice looking cars. I had a Monte Carlo SS . Nowhere as fast as the Buick was. That was time engines were low HP. In away it’s sad nobody got to enjoy driving it. It would be full of parking lot dings and scratches. I had a 14 Chevy SS and I was afraid to drive it anywhere I would have to park it. It got to the point that I sold it. Sad that other people don’t care about cars like we do. In 2010 I bought a 1989 Corvette with six miles on the odometer. Spent $6,000 to get it drivable. Every mile driven depreciated it’s value. Auctioned it for $10,000 in 2014 with 16K miles. Had fun with it but took a large loss. This Buick should not be driven over 1,000 miles a year.